Expand your repertoire with this eye-popping, mouthwatering assortment of recipes adapted from nine Boston-area bakeries. These tender, cake-like cookies, coiled into snails, have a subtle anise flavor. The recipe, from Andy and Jackie King of A&J King Artisan Bakers, goes back over six generations in Jackie’s family to a small town in southern Italy. For a festive look, add sprinkles before the icing sets. In the bowl of an electric mixer, beat the eggs and oil at medium-high speed until foamy. Continuing with mixer at medium-high speed, beat in the granulated sugar, then add the vanilla, anise, and orange juice, and mix well. Beat in the baking powder. Add the flour, 1 cup at a time, and when the dough becomes difficult to mix, switch to a dough hook or stir with a firm rubber spatula. Mix until the dough comes together in a ball. If the dough is sticky, add a little more flour. Pinch off 1½-tablespoon-sized pieces of dough and roll into ¹/³-inch-thick ropes about 7 inches long. On an ungreased cookie sheet, form each rope into a snail shape, starting at the center of the spiral, and gently press in the end of the rope to seal. Place cookies about 2 inches apart. Bake for about 10 minutes or until the cookies are puffed but still pale. They shouldn’t brown on top, but should be golden on the bottom. Transfer cookies to a wire rack to cool. For the icing: In a small bowl, mix the confectioners’ sugar with lemon juice and water until the icing is smooth, shiny, and thin enough to be easily spread. When the cookies are completely cool, lightly spread the icing on the tops with a small spatula. Store the cookies in an airtight container for up to 3 days. Celebrate wintry flavors of ginger, cinnamon, and clove in these spicy cookies that are lightly crisp around the rim, soft and chewy in the center. Joanne Chang, owner of Flour Bakery + Cafe, which has locations in the South End and Fort Point Channel, says these cookies have been a customer favorite since day one. In a small saucepan over low heat, melt the butter. Cool for 10 minutes or until no longer hot. In a large bowl, whisk together the melted butter, brown sugar, molasses, and egg. Beat with an electric mixer for about 20 seconds or until well blended. In a medium bowl, whisk together the flour, baking soda, ginger, cinnamon, cloves, and salt. Using a rubber spatula (or beaters on low speed), stir the flour mixture into the butter mixture until fully blended. Refrigerate the dough for at least 3 hours to firm. Heat the oven to 350 degrees. Line a cookie sheet with parchment paper. Put granulated sugar in a bowl. Pinch off rounded teaspoon-sized pieces of the dough and roll each into a 1¼-to-1½-inch ball; place them, a few at a time, in the bowl of granulated sugar and toss to coat. Place the balls on the prepared sheet about 3 inches apart. Bake for 13 to 14 minutes or until the cookies are crackly on top and just barely firm to the touch. Carefully slide the parchment paper (with the cookies on it) off the cookie sheet and onto a wire rack. After about 5 minutes, transfer the cookies to another rack to cool completely. Store the cookies in an airtight container for up to 2 days. Husband-and-wife team Abe Faber and Christy Timon of Clear Flour Bread fiddle with recipes until they come out just the way they want them, which in the case of these intensely chocolaty macaroons is delicately crisp on the outside and almost creamy on the inside. Their secret? Freezing the unbaked mounds before baking. In a large metal or glass bowl, combine the semisweet and unsweetened chocolates. Place the bowl over a saucepan of about 1 inch of barely simmering water. (Don’t let the bottom of the bowl touch the water.) Melt the chocolate, stirring frequently, until just melted. Remove the bowl from over the water. In a large clean bowl, beat the egg whites until foamy. Slowly add the sugar and keep beating until the mixture has a melted marshmallow consistency. Using a firm rubber spatula (or change to the paddle attachment if using an electric mixer), mix in the vanilla, melted chocolate, and coconut until fully blended. The dough will be thick. Heat the oven to 350 degrees. Bake the frozen macaroons for 16 to 20 minutes or until the outsides have developed a delicate crust and the tops are set. Slide the parchment paper (with the macaroons on it) off the cookie sheet and onto a wire rack. Cool completely. Store the macaroons in an airtight container for up to 2 days. Similar to rugelach, these date-and-nut-filled spirals at Tatte Fine Cookies & Cakes are a lovely (and eggless) addition to the holiday table. Owner Tzurit Or says you can substitute fig paste or almost any flavored jam for the date spread. Heat oven to 325 degrees. Line a large cookie sheet with parchment paper. In a medium bowl, combine the dates and ²/³ cup of boiling water and let dates soften for at least 20 minutes. In a food processor, mix together the flour, 1 cup of confectioners’ sugar, and baking powder. (The dough can also be assembled in a large bowl using a pastry blender.) Add the butter and pulse until the dough forms coarse crumbs. Add the milk and pulse until the dough starts to clump together. If using a processor, dump the dough into a large bowl; use your hands to form a ball. Divide the dough in half. In the processor (there’s no need to wash it), pulse the dates with the water until they form a thick paste. You should have about 1 cup of puree. Bake for 45 minutes (or 5 to 10 minutes longer if frozen) or until pale golden and just firm to the touch. Let cool on the cookie sheet to room temperature, then transfer to a cutting board. Use a serrated knife in a long sawing motion to cut the rolls into ¾-inch slices. Just before serving, sprinkle with confectioners’ sugar. Store the cookies in an airtight container for up to 4 days; to freshen, heat for a few minutes in a 350-degree oven. For these thin, lacy rounds to be crisp, says Barbara Weniger, owner of Lakota Bakery, “you have to let them get good and brown.” But don’t leave the kitchen, because they go from perfect deep brown to burned in seconds. Gild the lily, if you like, and coat the bottoms with melted semisweet chocolate. Heat the oven to 350 degrees. Line 2 cookie sheets with parchment paper. In a large, heavy saucepan over high heat, bring the butter, cream, and sugar to a boil. Reduce heat to moderate and simmer (the mixture will bubble energetically at first), stirring occasionally with a wooden spoon. After about 7 minutes, start stirring constantly as the mixture thickens and begins to pull away from the sides of the pan. Continue to gently simmer and stir until thick and milky tan, about 2 to 3 minutes more. Off heat, stir in the flour, almonds, marmalade, and vanilla. Scoop balls of 1½ teaspoons batter each and place 3 inches apart on the prepared sheets. (The cookies will spread.) Tuck your fingers into a plastic bag and flatten the balls into disks about ¼ inch thick. Bake, a sheet at a time, for 7 to 9 minutes or until the cookies are deep brown, slightly darker around the edges. Carefully slide the parchment paper, with the cookies on it, off the cookie sheet and onto a wire rack. Let sit for at least 3 minutes, then use a thin metal spatula to transfer the cookies to another rack to cool completely. Store the cookies, layered between sheets of wax paper, in an airtight container for up to 1 week. Coarse sugar coats the rims of these simple butter cookies, making them a pretty addition to any dessert plate. Vicki Lee Boyajian, owner of Vicki Lee’s, has baked these cookies for more than 15 years at her various shops. 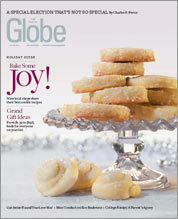 Look for sanding or sparkling sugar at Sur la Table, Williams-Sonoma, or craft stores. In a large bowl, beat the butter and sugar with an electric mixer until creamy, about 2 minutes. Beat in the vanilla. With the mixer on low speed, beat in the flour and salt just until fully blended. Using your hands, shape the dough into a ball. Divide it in half. Working with half of the dough at a time, roll into a smooth log about 10 inches long and 1½ inches in diameter. Wrap each log in plastic wrap, secure with an outer layer of foil, and refrigerate or freeze until firm. (Logs can be frozen for up to 2 months.) The dough should be cold and firm for slicing but not rock hard. Heat the oven to 300 degrees. Line a cookie sheet with parchment paper. On a sheet of wax paper, sprinkle the coarse sugar. Working with 1 log at a time, brush with the egg wash. Roll in the sugar. Using a sharp knife, cut the dough into ¹/³-inch-thick slices, then place them about 2 inches apart on the prepared sheet. Bake for about 18 minutes or until the tops are firm to the touch and the edges are lightly golden. Let sit on the sheet for about 5 minutes, then carefully transfer the cookies to a wire rack to cool. Store the cookies in an airtight container for up to 5 days. These Swiss chocolate almond cookies come courtesy of Jorg Amsler of Truly Jorg’s Patisserie. Because the cookies sit before baking, the outside is chewy and the inside moist. In a food processor, grind the almonds until they have the texture of coarse sand. (You should have a little less than 4 cups.) Place the almonds in a large bowl. Whisk in the 16 ounces of confectioners’ sugar and cocoa powder. In a medium bowl, beat the egg whites until they form soft peaks. Stir the whites and kirschwasser into the almond mixture until fully blended. The dough will be thick and fairly stiff. Chill for at least 1 hour. Line 2 large cookie sheets with parchment paper. Place the dough on a clean work surface or sheet of wax paper and roll it out into a ½-inch-thick slab. (Sprinkle the dough with confectioners’ sugar if the rolling pin sticks.) 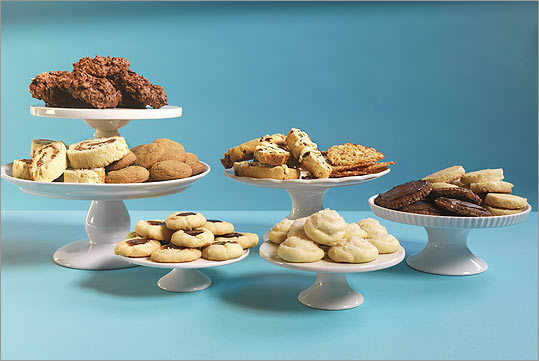 Use 1½-to-2 ½-inch cookie cutters (using smaller cutters yields more cookies) to stamp out cookies. Place the cookies on the prepared sheets. Let sit overnight in the refrigerator. Heat the oven to 400 degrees. Bake the cookies, a sheet at a time, for about 8 minutes or until the tops are just set. Let sit on the sheet for a few minutes, then transfer the cookies to a wire rack to cool completely. Melt the chocolate in the top of a double boiler or in the microwave, stirring frequently. Dip the tops of the cookies in the melted chocolate or coat them using a small spatula. Let the cookies sit at room temperature until the chocolate is dry. Store the cookies in an airtight container for up to 3 days. Eunice Feller, baker-owner of Bread & Chocolate, likes to have these cookies on the holiday dessert table for her husband’s large Italian family. The biscotti are packed with dried cranberries and pistachios, and a drizzle of melted chocolate sweetens each bite. Maura Kilpatrick, pastry chef at Sofra Bakery and Cafe, turned a recipe for Syrian-style shortbread into a thumbprint cookie. The cookies have a delicate sandy texture and pure buttery flavor. In the bowl of an electric mixer, whisk together the clarified butter and sugar. Refrigerate until firm, at least 45 minutes. Line a large cookie sheet with parchment paper. Once dough is chilled, pinch off tablespoon-sized pieces and roll into 1-inch balls, placing them about 2 inches apart on the prepared sheet. Make a small but fairly deep indentation using the rounded end of a wooden spoon or your thumb. Chill the cookies for at least 30 minutes to firm. Heat the oven to 300 degrees. Fill the indentations with about ¼ teaspoon of jam each. Bake for 23 minutes or until the cookies are just slightly pale golden. Carefully slide the parchment paper, with the cookies on it, off the cookie sheet and onto a wire rack. Cool the cookies completely before removing from the parchment paper. (Crumbs will stick to your fingers unless the cookies are thoroughly cooled.) Store the cookies, layered between sheets of wax paper, in an airtight container for up to 5 days. To clarify butter in the microwave: In a microwave-safe bowl, melt ¾ pound (3 sticks) of unsalted butter on high, uncovered, for about 2 minutes or until the milk solids have separated from the butterfat. Do not stir. Skim off the white foam on top, then slowly strain the clarified (clear yellow) butter into a measuring cup, leaving behind the milk solids. To clarify butter on the stove top: Melt ¾ pound (3 sticks) of unsalted butter in a medium saucepan over medium heat. After the butter melts, it will bubble wildly for a few minutes while the water in the butter evaporates. Do not stir. When the bubbling lessens, the butterfat will be clear yellow. Strain the clarified (clear yellow) butter into a measuring cup, leaving behind the milk solids. Lisa Zwirn is the author of Christmas Cookies: 50 Recipes to Treasure for the Holiday Season. Send comments to magazine@globe.com. See the best cookies around the area, and bake them in your home.